This book chronicles the experience of the World War II paratroopers from their earliest days in training to final days of the war spent at Berchtesgaden. Relying heavily on memoirs, letters, and personal interviews with soldiers, this work highlights the rigors of training, the spectacle of combat, and the relief of survival and victory. From D-Day to Bastogne, Kaufmann follows the American advan… ce across France, shedding light on the emotional strain and shock of combat that was, until recently, often overlooked by generations of Americans, but freely admitted to by the Vets themselves. 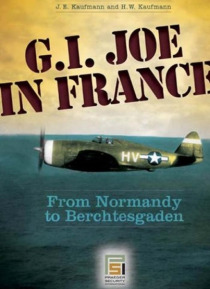 Along the way, the book details the struggle faced by American G.I.s as they made their way through France. Indeed, it becomes clear the Nazis were not the only obstacle to Mutt and Joe during the campaign. The common problems of supply and relief often exacerbated difficult conditions in the field, while incompetent line officers often raised doubt and suspicion among men in the ranks. Ultimately, this is a very personal story about struggle and triumph, told by those who endured the hardship of combat.